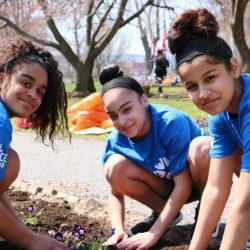 Reading, PA — Youth Volunteer Corps of Reading will host Global Youth Service Day (GYSD), a Youth Service America international event, on April 14 in City Park. Now in its 31st year, GYSD is the largest and longest-running youth service event in the world, and the only event dedicated to celebrating the contributions that young people make to their communities year-round. 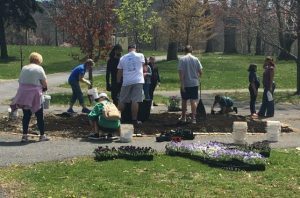 On Sunday, April 14, volunteers of all ages will participate in service projects throughout City Park, 11th and Washington Streets, from 1-3 pm. The event on Sunday will culminate in a celebration of youth service with food, games, music and youth recognition awards from 3-4 pm. Youth Volunteer Corps of Reading has partnered with Reading Public Works Department, Berks County Monument Preservation Fund and Reading Beautification, Inc. for the fourth consecutive year to organize service projects in City Park including: general park clean-up, flower planting, mulching, park beautification, painting etc. The event in City Park will engage approximately 200 volunteers and will be supported by various organizations, groups, and school districts. 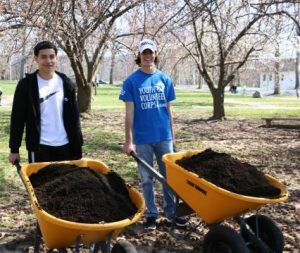 Select Berks County students will also be recognized for their service hours in the community through Youth Volunteer Corps over the past year. VOiCEup Berks, a fund of Berks County Community Foundation and an affiliate of Youth Volunteer Corps, is a local organization dedicated to connecting all sectors of Berks County to volunteer opportunities through service learning. Formed in 2015, VOiCEup is the collaborative effort of a group of experienced volunteers who are committed to the power of service. As an affiliate of Youth Volunteer Corps (YVC), VOiCEup engages youth ages 11-18 in meaningful community service. GYSD will serve as one of the Youth Volunteer Corps Days of Service that is offered to local youth.